Remember this photo of our kitchen wall? The photo looks lovely, but in reality, the wall is very big...and...very...empty. So I thought. And thought. And thought some more. About what I felt would be the best way to fill that big, empty wall. I knew I wanted a statement piece. And then it hit me.....A GIANT CHALKBOARD! I'm so excited!! The hubby and I are going to look for wood today so that he can make me a giant chalkboard. Just call it an anniversary gift. 14 years today. I am so grateful to be married to my best friend. Happy Anniversary! What a sweet wedding photo! And to have a husband who doesn't even blink as he agrees to build you a chalkboard - you are a lucky woman! Have a wonderful day! Love the idea. I did a huge one on our blank wall too. The kids use it more than I do. I would love to do a huge one too but I just don't have the wall space. =( Darn open floor plan! I'm a huge fan of chalboards, too. I'd love to do a huge one in my kitchen at some point. Happy Anniversary! Hope you enjoy a lifetime's worth of more of them! i just painted my powder room walls with chalk board paint. we love it! make sure you "prime" the chalkboard before writing on it. i didn't know about doing this and the first time we wrote in it the letters were "burned" into the paint. to prime- take the chalk on it's side and rub over the whole chalk board, then wipe/wash it off. that's all! have fun! OOOH can't wait to see it! :) I've been cookin' up a similar idea for our entry way. I can't wait for the finished project! ..happy anniversary! !...i'm not far behind the 14 years...sheesh where did the time go?!?! I can't wait to see the chalkboard! It is going to look great! I grew up with a chalkboard in my kitchen so I always wanted one but I have limited wall space in my kitchen now. But I used a skinny vintage door, stripped it and painted the middle part with chalkboard paint and it proudly hangs in my kitchen. My oldest grandson loves it as do any adult who sees it. Everyone finds it hard to resist leaving a message and I adore that part. Have fun with yours. Happy Anniversary - I love chalkboards! Happy Anniversary! I just discovered chalkboard paint and my house got a bit of a makeover, love it! Happy Anniversary. Can't wait to see the wall! Congrats! Have a happy day! I LOVE the giant chalkboard idea. Can't wait to see how it turns out! The chalkboard will be perfect for that wall. Happy anniversary to you both! I recently did this project too, although I didn't have a huge wall...so I took a great big frame (that I loved) with photo/painting inside (that I didn't love) and basically painted the chalkboard paint right onto the glass. It dried nicely, hung it up and I have a really cool chalkboard now hanging in between my mudroom and kitchen where we leave notes or sayings. Aww, that's so sweet. That hubby of yours definitely knows the way to a girl's heart). Who needs chocolate when you can have a giant chalkboard that will make you smile every time you look at it (I'm being totally serious, by the way). Happy Anniversary. Nothing like sharing some chalkboard love. Awesome!! Can't wait to see your results. All those inspiration photos are stunning as I'm sure yours will be. Isn't it great how we get to steal (er - I mean share) ideas here in blogland?? You can also paint the chalkboard directly onto the wall and frame with some molding. Congrats and what a great idea :) I can't wait to see the finished product. What a beautiful wedding picture! Happy Anniversary! Isn't it great to be married to a wonderful man? We're coming up on 25 years this June (gulp! Can I really be that old?! ), and I'm so grateful. I'm excited for you and can't wait to see the results. I'm sure it will look fantastic. Happy Anniversary too! That Heather Chadduk dining room photo is actually one of my absolute favorites! Has been a great source of inspiration. Happy Anniversary! Beautiful wedding photo, what a sweet moment captured! Can't wait to see your finished chalkboard! Fantastic idea! Can't wait to see the new chalkboard wall! I too have big chalkboard plans for my kitchen. I'd like to turn my pantry door into a chalkboard. Gotta get my hubby on board first. ohhh....a chalkboard wall that will be awesome!! Can't wait to see! I LOVE me a big chalkboard! Happy Anniversary! I love the chalkboard idea! Happy Anniversary! Cant wait to see the completed project! 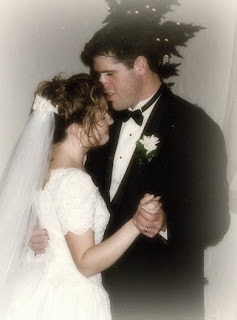 Happy Anniversary Wendy. What a handy husband you have. I love the chalk board idea. Can't wait to see your all finished. Here's to many more years of wedded bliss! That will look great. Can't wait to see it. Congratulations on #14! It is rare these days, it seems, to even make it past 5. Your blog is just lovely and I enjoy reading it on a daily basis! Happy Anniversary! What an awesome wedding photo. Looks very nice. Thanks and keep blogging. AW!! Congrats sweetie! I remember your reception. It was so elegant and you were so beautiful. Wow. Time flies. Love you.